I’m writing this in response to the article that was shared with me titled “Colleges connect the textbooks: How colleges are integrating digital textbooks with back-end learning and administrative systems”. That article speaks to the challenges presented as higher education institutions attempt to more fully integrate learning resources into their learning management system (LMS). In my professional world as an educational technologist and online course designer and teacher, there is a continuum of beliefs about the future of the LMS, anchored at opposite ends by two schools of thought I’ll describe as “centralized” and “decentralized”. Current popular LMS products such as Blackboard, Moodle, and Canvas are on the trajectory to becoming more and more centralized. By “centralized” I mean, one system within which all learning resources are fully integrated with only one login and no jumping out to other apps or web resources. If there’s a video to watch, it’s embedded on the learning content page. If there’s a student interaction or collaboration, it happens within the platform. If there’s a test to administer, the system offers its selection of assessment tools. Administrators and IT managers are favorable to this future as it makes their jobs much easier. For administrators, institutional data can be extracted from one source, they can keep their promises of consistency and uniformity, and there are fewer third parties to pay for learning resources (preferably just one, e.g. Blackboard). For IT managers, deploying a CLS means only having one service (or maybe a few) to maintain to keep classes running. They can control access and specify requirements on the user side that align with what IT is willing or able to support. However, the future development of a fully integrated CLS presents a variety of challenges. The biggest impediment is in designing the system to integrate with all the possible learning resources that are being produced at a currently rapid rate. At my institution, we see this with enduring the frustrations of continuous updates to our LMS as new features break old features, and patch after patch makes the system unwieldy at some point. There’s always hope that API development can enforce a level of uniformity for integration, but it seems we never reach a level of stability and systems eventually crash. The integration limitations of a CLS often result in a choice to not innovate as rapidly as one might wish – because the innovation might break the system. CLS development often requires institutions to develop their own content (at great costs) rather than relying on a third party’s content that might be cheaper or even available for free. And instructors and students become frustrated when they can’t teach or learn as they see best. As an analogy from traditional face-to-face instruction, a fully integrated CLS is like outfitting a classroom whose four walls contain a limited set of learning resources. Only resources that can easily be managed and can co-exist are allowed in the room. Instructors and students enter that space and can only do what is possible with the existing resources. There is no option to take the class out to other spaces to take advantage of other resources. Holding instructors accountable for what happens within that room is easy, as well as, managing the resources placed in the room, tracking the students working in that room, and evaluating the artifacts of the learning that happens in that confined space. In the end, administrators and IT managers are pleased because a dream CLS is a system they can manage and replicate relatively easily. Rather than describing the future on the other extreme of the continuum as a “system”, I prefer to call it a “network”, though maybe I’d settle for an “ecosystem”. This viewpoint assumes the promise of a fully integrated LMS is never attainable. Our institution’s experience with Blackboard is a history of promises of new features, patches and add-ons that either are released much later than promised or never materialize. Rather than confining instructors and learners within four walls like my earlier analogy, a DLN frees both to explore a global panoply of possibilities – each making choices, sometimes on the fly, not based on the limitations of the LMS but according to their own teaching and learning goals. In some ways, DLNs already exist anywhere you have access to a digital platform on which you can place hyperlinks to learning resources that exist somewhere outside of your institutional control. But a true DLN according to my vision, like a fully integrated CLS, does not exist. There are at least two barriers to the development of a DLN. One issue is in regards to intellectual property – i.e., Who owns the resources? What rights are provided for using the resources? How are the owners’ rights protected? And, who owns an amalgamation of others’ resources? In no way do I desire a world that does not honor intellectual property as it is most necessary for incentivizing creativity and innovation. Our copyright law, much of it written long before anyone imagined such a global and digitized world, doesn’t provide us with all of our answers. However, developments such as the Creative Commons and the Open Education movement (sparked by MIT in 2002) are providing legal avenues for benefiting from resources that are at our fingertips due to the internet. The second barrier to the development of a DLN is the challenge of building into it the management and accountability features that higher ed administrators need to do their jobs. But there is a potential solution for this that is just on the horizon, or maybe even a little closer than that: Blockchain. Blockchain itself is a decentralized technology that does away with the limitations of single-location systems. A “block” is a record of a transaction that is stored on a ledger, secured and accessed across a distributed network. Blocks in a blockchain can not be hacked or altered or lost or deleted (in theory!). If applied to a DLN, blockchain technology is possibly the missing piece that can provide the accountability for, and the certification of, teaching and learning that currently only an CLS can satisfy for an administrator. Blockchain is in its infancy and not fully developed, but is already being implemented to make digital currency transactions possible, track shipments around the world, and manage natural resources, all on huge scales. My reading of the tea leaves is that technology is leading us to a less centralized management of all types of resources rather than more centralized. I began stating my case here by describing two schools of thought on extreme ends of a continuum. The future as I see it, will never reach those extremes but land somewhere in between. In the case of education, there will be a natural tension as this all gets sorted out between higher ed administrators and IT personnel who will favor a more centralized system that guards the boundaries, and instructors and designs like me who will always favor a more decentralized network that opens the doors for learners to engage in a world of possibilities. 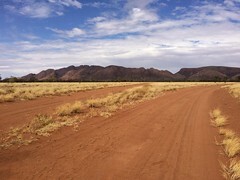 Photo credit: The photo of the “Two Paths” is mine, taken in the middle of nowhere in the Australian Outback. I have shared this image with the world here under a Creative Commons BY-NC-SA 2.0 license.